We begin our 27th academic year at Central European University this week. 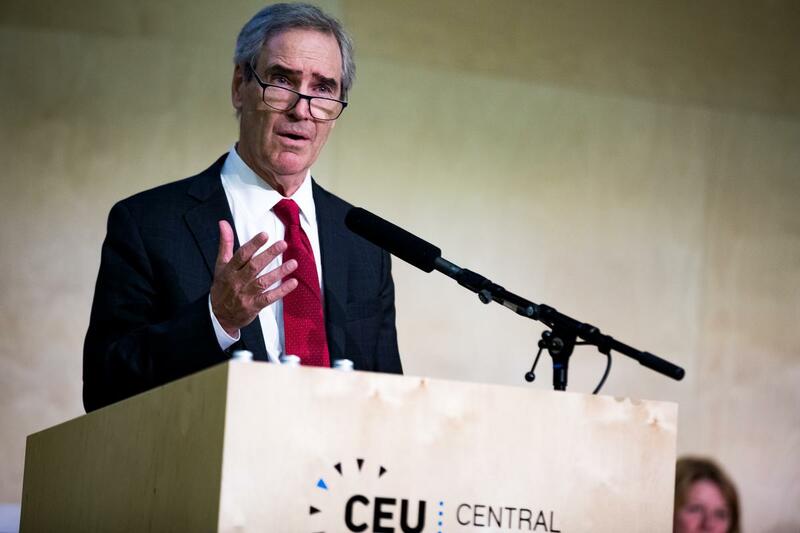 At our 2017 Opening Ceremony, we welcomed 769 incoming students from 93 countries and recognized the extraordinary teaching and research taking place at CEU and elsewhere in Europe. Our community continues to inspire as we carry forward our mission to search for truth and add to the world’s precious stock of knowledge. To the rectors and representatives of Hungarian universities. To the incoming CEU class of Masters and Doctoral students—all 769 of you from 93 countries—we hope CEU will be a transformative experience and we welcome you warmly to this community. As many of you know, New York State, where we are accredited, and the Government of Hungary are negotiating an agreement that would enable us to stay in Budapest. Negotiations continue, but we remain hopeful that an agreement can be reached and ratified by the Hungarian Parliament. This experience—still ongoing, still unresolved, but hopefully soon behind us—has changed us all. We have rediscovered why free institutions matter and why our open society mission is so important. We are the only university with such a mission. What does it mean? Let’s be clear, first of all, what it doesn’t mean. It’s worth saying, once again, we’re not a political organization, we’re not an opposition movement, not an NGO. Though we encourage our students, staff, faculty, and alumni to be active citizens and to express their political convictions freely. We ARE a university: a free, self-governing institution, independent of government, independent of those who finance us, a community of scholars and students whose task is to search for truth and to add to the world’s precious stock of knowledge. And what is knowledge? The unbroken strand of understanding that human beings have woven together through experimentation, research and experience and that they have passed on from generation to generation. Our mission as a university is to weave our tiny thread of knowledge into this strand of understanding and to pass it on unbroken to our children. There is no single vision for an open society—that would violate the principle of openness itself—but all visions of an open society share a critical component: the belief in an epistemology of freedom: that the ideas we need most arise from critical debate and the courage to discard them when they fail the test of reality. A university lives by this epistemology, but its goals are ethical. We are the institutions whose very essence is to create free people: responsible, prudent, moral human beings who do their best to care for their families, care for their country, care for each other. An open society is a society of such men and women. Such people are skeptical but passionate citizens. They know the distinction between knowledge and opinion, between a fact and a rumor, between a tweet or a post and a research finding, between passion and sound judgment. Grasping the core of knowledge is hard. It is the work of a university every day, in every class: to teach men and women to make these distinctions, to do so fiercely, to subject all ideological claims—liberal and conservative alike—to the critical scrutiny that only knowledge of real life allows. This is our mission. We hope you will feel it at work in our classrooms, in our lectures and seminars. We are an institution under constant scrutiny and external pressure. But that must not prevent us from being critical of ourselves. We re-examine our mission every day. We question whether we are measuring up. You will see that we are running a presidential lecture series entitled, Rethinking Open Society. Join us for these talks, form your own opinion about what open society means. The first one is on Monday, and guess who is starting it off: yours truly. So come, be critical. Join the debate. In a moment you will hear a poem read, by one of the greatest spirits of our region and of our world, Czeslaw Milosz, the Polish Nobel Laureate in Literature. In it you will hear him say, “human reason guides our hand so we write Truth and Justice with capital letters, lie and oppression with small.” You will also hear a Kodaly song sung by a Hungarian artist. Their inclusion in this program is our way of saying: poetry, art, literature, music teach us our mission every day. We will have a good year, together. I know it. We will argue, we will debate. The library will be full. Your heads will feel full with the pressure of new ideas. You will be changed.